There have been fifty-eight national emergencies declared by presidents since 1979 pursuant to the National Emergency Act passed in 1975. President Trump plans to enact the sixtieth to build a wall along the Southern Border in the face of an immigration crisis. While declaring a national emergency is nothing new for U.S. presidents, doing so to bypass Congress’s spending authority is unique. The move would be the first time a president declared a national emergency to free up funds that Congress declined to provide. The President’s avenues to provide funding for the border wall are complex; understanding them involves a multitude of statutes to fully understand where the authority and money will come from. This blog will discuss the constitutionality of the President’s power to declare a national emergency to bypass Congress’ spending power and detail the Trump Administration’s argument. At first blush, it may seem that the power of the president to declare a national emergency to appropriate funding would be the crux of the Trump Administration’s argument. However, there is alarmingly little guidance on what a president must show to declare a national emergency. The argument may lie within whether Congress has expressly or implicitly authorized the President to appropriate funding for the wall. Youngstown Sheet & Tube Co. v. Sawyer is informative. Justice Jackson’s concurrence in Youngstown introduced “the three buckets of presidential power”. Justice Jackson eloquently pronounced that the President’s power is at its greatest when he “he acts pursuant to an expressed or implied authorization of Congress” and inversely, the President’s power is at its lowest when he “takes measures incompatible with the expressed or implied will of Congress”. Then there is a “zone of twilight” when the president acts “in absence of either a congressional grant or denial of authority” where he can “only rely upon his independent powers”. Courts and legal scholars continually cite to Jackson’s concurrence to help parse out the scope of presidential authority. Unfortunately, Justice Jackson says nothing about what to do once you determine which category of power the President is in; only that in the highest bucket, the president is likely to win, and in the lowest the president is likely to lose. How would this analysis turn out in the present case? On one hand, Congress has expressly approved a spending bill giving $1.6 billion towards construction of the border, therefore, Congress has appropriated what they believe necessary to secure the border and implicitly denied the President anything more than that. Moreover, the Constitution gives spending power to Congress, and some would argue the President only has the power to spend money that Congress deems necessary. Challengers to the declaration might argue this puts the President in his lowest “bucket” of power. Additionally, if the Senate overrides the national emergency declaration in a vote (subject to presidential veto) pursuant to the National Emergency Act, it would be an expression of disapproval to extend the President the funding he requires. On the other hand, there are a number of statutes passed by Congress expressly giving the president power to acquire additional funding. The Trump Administration has outlined which statues it will rely on its website, some of which require a National Emergency while others do not. Since Congress passed these statutes it naturally follows that they have implicitly approved of the President’s power when acting pursuant to those statutes. This would put the President in the “bucket” where his power is strongest. In reality, The Supreme Court historically defers to the Executive and Legislative branch when faced with national emergency arguments. Thus, assuming arguendo that the Supreme Court will uphold President Trump’s National Emergency Declaration, the next step is to look at which statutes the Administration will rely upon, and if the Supreme Court will rule that the President is using the statutes correctly. The White House has announced that it intends to identify $8.1 billion that will be available to build the border wall. $601 million will come from the Treasury Forfeiture Fund, up to $2.5 billion under the Department of Defense funds transferred for Support for Counterdrug Activities (U.S.C Section 284), and up to $3.6 billion reallocated from Department of Defense military construction projects (Title 10 U.S.C. Section 2808). Of these statute’s only U.S.C. Section 2808 requires a national emergency. The National Emergency Act of 1976 governs the President’s power to declare a national emergency This blog will analyze each of the aforementioned statutes. 10 U.S.C. § 284 allows the Secretary of Defense (again Executive Branch) to provide support for “counterdrug activities or activities to counter transnational organized crime . . . if requested by an appropriate department or agency of the Federal Government.” One of the stated purposes for which such support can be granted is “the Construction of roads and fences . . . to block drug smuggling corridors across international boundaries of the United States.” The President will likewise have little trouble gaining access to funds pursuant 10 U.S.C. § 284. The language of the statute gives expressed access to funds to combat drug smuggling by building a “fence.” Opponents of the wall will cite research showing drug smuggling across the border is down, and that most drug smugglers go through ports of entry as opposed to random unfenced areas of the southern border (this will likely be used to prove there is no national emergency). However, this does not eliminate the possible argument that additional fencing will lower the number even further, or alternatively, allow law enforcement around the border to focus their efforts on ports of entry. Furthermore, the statute has no requirement that a national emergency be in effect; the funds are available at the Secretary of Defense’s discretion. 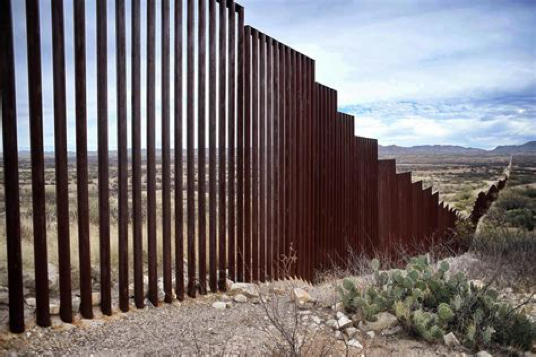 Another argument the opposition will put forth is that while the statute allows funding for “fences,” the Trump Administration is using it for a “wall.” A U.S. Court would likely find this argument tenuous at best; a wall, a fence, a steel barrier, or any other way it’s framed serves the same purpose, but it is a distinction that the Trump Administration will need to address. Lastly, a White House briefing notes that the funds used from the Counter-Drug Activities account will be used on land already owned by the Federal Government.”In all likelihood, the $2.5 billion President Trump seeks pursuant to the 10 U.S.C. § 284 will survive a legal challenge. Before taking a look at the President’s last proposed source of funding, which does require a national emergency, it is necessary to take a look at the National Emergency Act. That National Emergency Act, signed into law in 1976, was originally drafted as a way to curb national emergency declarations. The statute lays out clear cut restrictions on how long a national emergency can last without renewal or Congressional approval and allows a joint resolution by Congress to terminate the emergency, which is what we see Congress contemplating now. In fact, most of the language of the statute deals with procedural and administrative guidelines that create obligations on the president. For example, a national emergency automatically terminates ninety days after it’s anniversary of declaration, and Congress is supposed to meet within six months of a declaration to determine if there is indeed an emergency. Additionally, the President must submit his findings and proof that there is a national emergency to Congress. Congress constructed The National Emergency Act to give a clear cut check on the President’s power to declare a national emergency. However, as Congress never met to consider a vote to stop the national emergency as is their right every six months. Also the joint resolution power to stop a national emergency declaration was amended in 1985 and is now subject to presidential veto. The statute’s requirement that it be renewed or terminated a year after an emergency’s enactment has done little to slow down the state of national emergencies. Presidents routinely renew the emergencies, and as of today, 28 emergencies declared under the National Emergency Act remain enacted. Although the National Emergency Act started with good intentions to limit presidential power, it has in practice lost its force. Notably, and perhaps most importantly , the statue is devoid of any definition of what constitutes a national emergency, leaving no guidelines for courts to follow when determining whether a state of emergency exists. Consequently, the Supreme Court may be more likely to defer judgement to the President, or suggest to the Legislative Branch that if it wants more constraints on the president’s power, it should amend the law. The strongest legal challenge to the proposed funding will come from access to $3.6 billion pursuant to 10 U.S.C. § 2808, which does require a national emergency. 10 U.S.C. § 2808 allows the Secretary of Defense, “in the event of a declaration of war or a declaration by the president of a national emergency in accordance with the National Emergencies Act that requires the used of the armed forces” to undertake “military construction projects . . . not otherwise authorized by law that are necessary to support such use of the armed forces”. President Trump intends to access around $3.6 billion of funds for the border pursuant to this statute, and it will most likely be a source of great debate. Assuming the national emergency declaration will be upheld, the Trump Administration will still need to prove that building the border wall is a “military construction project” and that it is “necessary to support such use of the armed forces”. “Military construction” is loosely defined within the statutes as “any construction, development, conversion, or extension of any kind carried out with respect to a military installation, whether to satisfy temporary or permanent requirements.” By this definition, the Trump Administration would need to categorize the border wall as a military installation. The statute contemplates the need for construction of military bases, the acquisition of land to secure such bases, and any fencing or defense needed to secure military areas. Broadening the legislative understanding of the term “military construction” may prove to be the largest barrier to President Trump’s access to the funding he seeks. Challengers of the national emergency declaration may face an uphill battle, as the Supreme Court routinely defers to the judgement of the Executive in matters of national security. However, if Congress is concerned, perhaps the judiciary isn’t the only option for halting President Trump. Congress could pushback with some of the procedural safeguards built into the National Emergency Act as it is currently doing with a show of disapproval through a joint resolution against the declaration. In the long term, Congress could try to create momentum in a bill to amend the National Emergency Act to better define what constitutes a national emergency, although this may be easier said than done, as it any amount of statutory language would have a hard time accounting for the multitude of security threats America plausibly faces. The power of the President to declare a national emergency is always hotly contested and the Trump Administration’s case will be no different. Grace Segers, How Many National Emergencies Have Been Called by Presidents?, CBS News (Feb. 15, 2019), https://www.cbsnews.com/news/how-many-national-emergencies-have-been-called-by-presidents/. Alan Neuhauser, Trump Taps Civil Asset Forfeiture to Fund Border Wall, U.S. News, (Feb. 15, 2019), https://www.usnews.com/news/national-news/articles/2019-02-15/trump-taps-civil-asset-forfeiture-to-fund-border-wall. Jeffrey Rosen, Can the President Declare a National Emergency to Build the Wall?, National Constitution Center(Jan. 10, 2019), https://constitutioncenter.org/debate/podcasts/can-the-president-declare-a-national-emergency-to-build-the-wall. Id. at 635 (Jackson, J., concurring). Deirdre Walsh, House Approves Spending Bill With $1.6 billion For the Border Wall, CNN Politics (Jul. 27, 2017), https://www-m.cnn.com/2017/07/27/politics/spending-bill-vote-border-wall-money/index.html?r=https%3A%2F%2Fwww.bing.com%2Fsearch%3Fq%3Dcongress%2Bmoney%2Bto%2Bwall%26form%3DEDGTCT%26qs%3DPF%26cvid%3D3cc0eb90c3cc4089893d71c11d597b59%26refig%3Dc476fd53050c4138e831827d6f7891b3%26cc%3DUS%26setlang%3Den-US%26elv%3DAY3%2521uAY7tbNNZGZ2yiGNjfNLbF317ZRFBspX8HNzgZ8sbHDblGmemZBxd02XE%2521BeZQ7vcsRFx8TnvyXzGwczsJ9qe30CtSEqWawqtGv14jI1%26PC%3DDCTS. U.S. Const. art. I, § 8m cl. 1. Catherine Padhi, Emergencies Without End: A Primer on Federal States of Emergency, LawFare (Dec. 8, 2017), https://www.lawfareblog.com/emergencies-without-end-primer-federal-states-emergency. President Donald J. Trump’s Border Security Victory, The White House, National Security & Defense, (Feb. 15, 2019), https://www.whitehouse.gov/briefings-statements/president-donald-j-trumps-border-security-victory/; see also, e.g., 10 U.S.C. § 2808; 31 U.S.C. § 9705; 10 U.S.C § 284; 50 U.S.C. § 1922. Sean Illing, Trump Declared a National Emergency on the Border. I Asked 11 Experts If It’s Legal, Vox (Feb. 15, 2019), https://www.vox.com/2019/2/15/18225359/trump-speech-national-emergencies-act-border. President Donald J. Trump’s Border Security Victory, The White House, National Security & Defense, (Feb. 15, 2019), https://www.whitehouse.gov/briefings-statements/president-donald-j-trumps-border-security-victory/. The Funds Available to Address the National Emergency at Our Border, National Security and Defense (Feb. 26, 2019), https://www.whitehouse.gov/briefings-statements/funds-available-address-national-emergency-border/. Eugene Kiely, Will Trump’s Wall Stop Drug Smuggling, The Anneburg Public Policy Center of the University of Pennsylvania (Aug. 30, 2017), https://www.factcheck.org/2017/08/will-trumps-wall-stop-drug-smuggling/. The Funds Available to Address the National Emergency at Our Border, supra note 22. 50 U.S.C. § 1922(a); see also Gregory Korte, How Congressional Democrats could fight a Trump Wall National Emergency Declaration, USA Today (Feb. 8, 2019), https://www.usatoday.com/story/news/nation/2019/02/08/presidential-declaration-national-emergency-donald-trump-border-wall-congress-oversight/2784488002/. § 1922(c )(1). See also §1922(b). Next Fyre Festival Aftermath: New Rules for Influencers?